Corolla is the most important and demanding vehicle of the Toyota brand and now the 2014 model year is planning to step in the segment. The new 2014 Corolla gets a new dramatic design, renowned quality, high end efficiency and attainable price tag. 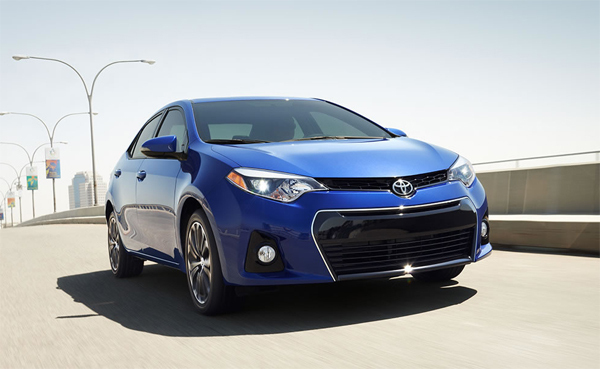 Toyota just announced the price for the most legendary and iconic compact sedan, the 2014 Toyota Corolla. The Corolla is offered in four trims for the 2014 model year, L, LE, S and LE Eco covering a broad and versatile range of customers, including those searching for a family vehicle for those want to purchase a more premium compact. The 2014 Corolla gets a starting price of $16,800 for the base L trim level. The other trim levels LE, S and LE Eco are priced at $18,300, $19,000 and $18,700 respectively. Each trim level has its own very unique and stunning features that are designed to entertain a particular group of customers with their own needs. The base trim L features a six speed manual transmission, low beam LED headlights, Led daytime running lights, Bluetooth connectivity, Whiplash Injury Lessening front seats and effective safety features. The upper trims get lots of other features that are of high quality and are technologically advanced. The 2014 Toyota Corolla’s get power from a 1.8 liter naturally aspirated four cylinder engine produces 132 horsepower and 128 lb ft of torque. In the LE Eco trim, the same engine is tuned to generate 140 horsepower and 126 lb ft of torque. The EPA estimated fuel economy is 27-30 mpg city and 36-42 mpg highway. Three different transmissions are offered to the lineup of the 2014 Corolla, a six speed manual, a 4-speed automatic and a CVT. An enthusiastic thing about the 2014 Toyota Corolla is that it is priced significantly less than its key rival Honda Civic.